Let’s begin today with a quote from chapter 2 of “The Screwtape Letters” by C.S. Lewis, in which a senior demon, named Wormwood, is giving instruction to a junior demon named Screwtape. When he refers to the “enemy” he means, “God”, when he refers to “Our Father” he means “the Devil”, when he refers to “the patient”, he means the man Screwtape is tempting. This is a passage where Wormwood is giving Screwtape instructions as to how to tempt his patient to turn his back on the Church, the Body of Christ. Our Epistle lesson today is from 1 Corinthians 13. This text is one that is often chosen for weddings, and it is a nice wedding text as it is all about love, and husbands and wives should love each other, but this text is not actually about married couples. This text is about how we are supposed to act as the Church; how we are supposed to treat one another in the Body of Christ. How we are to combat the devil’s temptations to tear us apart and leave the Church. Last week’s epistle reading was the previous verses about unity in the Church. 1 Corinthians 12:12-13 (ESV) 12 For just as the body is one and has many members, and all the members of the body, though many, are one body, so it is with Christ. 13 For in one Spirit we were all baptized into one body—Jews or Greeks, slaves or free—and all were made to drink of one Spirit. You are the Body of Christ; all of the baptized together. You have been redeemed by the blood of Jesus shed for you on the cross. You have been given the gift of Jesus’ perfection and holiness. Your body is the temple of the Holy Spirit. This is who you are in Christ. You are a vital part of the Body of Christ even though your life is messy, and mixed-up, and you continue to struggle with anger and greed and lust and hatred and selfishness. Still you are a part of the body of Christ with all the other sinful, selfish, mixed-up, messy people around you. As you look around here on Sunday morning each person you see is a fellow member of the Body of Christ on earth. That person that you see is someone for whom you are to care. This is what St. Paul is telling the Church in Corinth in our reading today. So you see that person that just annoys you. You know. The one that can’t stop talking about things you don’t care about. What do you do? How are you supposed to deal with each other? With love. What kind of love? Selfless love. The kind of love God has for you in Jesus; the kind of love you have been given as a fruit of the Holy Spirit bestowed on you in baptism. The great Good News is this is the kind of love you will naturally have for each other in the Heavenly City of New Jerusalem after the Judgement Day. Through Paul’s words God calls on the people in the church at Corinth and He calls on you in Christ’s Church today to love one another… to love one another as if the last day has already come. Love each other now like you will love in the Heavenly City, for the Church is a preview of the Heavenly City. In Corinth, like in the Church today, folks get confused as to what is important. Love is important. Without love for one another nothing else you do matters. The church in Corinth was having problems with some believers thinking they are better than others. Paul gently corrects them by giving examples about himself. He says, I could speak in the language of angels or be the greatest prophet, or have great knowledge, or great faith, I could give up everything, but without love none of it matters. What is this love like? St. Paul defines this love. We get two things that love is and eight things that love is not. Love is patient and kind. Patience is so hard. I joke that it is a bit dangerous to pray for patience because God may grant you a lesson. Patience is being able to accept and tolerate delay, trouble, suffering, and frustrations without getting angry or upset. Patience is an emotionally freeing practice of waiting and watching and knowing when to act and when not to act. Patience does not let the frustrations of life take control of your mood and make you an irritated person. Love is patient. Love is kind. Being kind is to be friendly, generous and considerate. Kindness gives others the benefit of the doubt. Kindness puts the best construction on other’s actions. Love is patient and kind. Love is not envious or boastful, it is not arrogant, it is not rude, it does not insist on its own way, it is not irritable or resentful; it does not rejoice at wrongdoing, but rejoices with the truth. Love is not envious or boastful. Love is not about keeping score with others about who has what; it does not get jealous of someone’s abilities or possessions and it does not brag about its own abilities or possessions. Love is not arrogant. Love does not think it is more important than someone else. Love does not think that it is too good to take out the garbage. Love is not rude. This might be better translated, “love does not behave indecently.” Love does what is right. Love cares for others as fellow redeemed children of God and not as objects for fulfilling selfish desires. Love doesn’t look at websites that you wouldn’t want to share with your mother. Love waits, and keeps intimacy inside the bond of lifelong marriage. Love does not insist on its own way. Love realizes that others may have a different idea or approach to solving an issue. Love knows it is not always right. Love listens to others. Love is not irritable or resentful. This goes along with love is patient. I know, for me, I can feel irritability creeping up. I get snappy. I get short-tempered. It does not help the situation; it just makes things worse. When you feel yourself getting angry with someone; look at the other person and ask yourself. How will I love them after the last day? Love does not rejoice at wrongdoing, but rejoices with the truth. This is beautiful. What is the opposite of wrongdoing? The truth. Do not celebrate sin, but instead rejoice in the truth of Jesus. Love does what is right because it is what is right. Love does what is right because it is the truth. 1 Corinthians 13:7 (ESV) 7 Love bears all things, believes all things, hopes all things, endures all things. This does not mean that love is stupid or blind, but more that love supports without limits; trusts without limits; hopes without limits. Love is without bounds and love is permanent. Love is not an efficient program or strategy. Love is messy. Love is inefficient. Love is vulnerable. This is how the body of Christ works; it works with love. In love, God the Father sent His Son Jesus to love you all the way to the cross. He gives you His love and calls you to love. The 10 commandments are summed up in five words. Love God; Love your neighbor. In Christ you are love. During the offering and when you get home, reread 1 Corinthians 13:4-7. Except replace the word “Love” and “it” with your name. 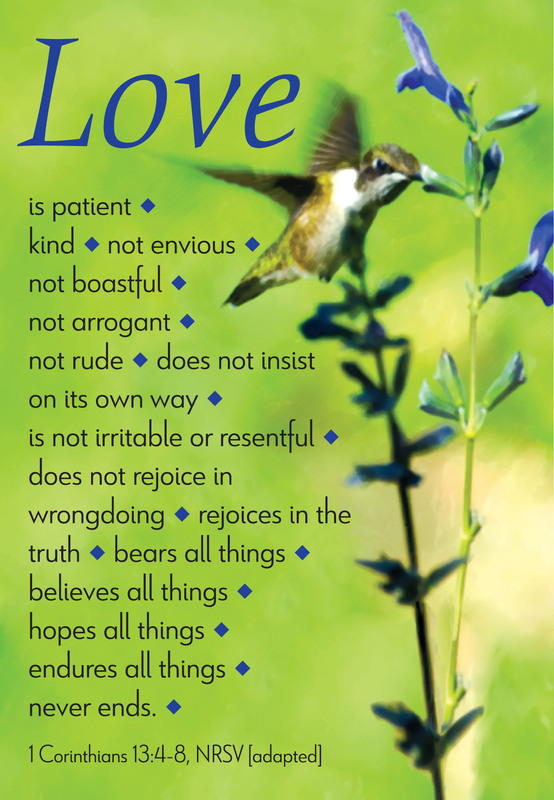 1 Corinthians 13:4-7 (ESV) 4 Kevin is patient and kind; Kevin does not envy or boast; Kevin is not arrogant 5 or rude. Kevin does not insist on Kevin’s own way; Kevin is not irritable or resentful; 6 Kevin does not rejoice at wrongdoing, but rejoices with the truth. 7 Kevin bears all things, believes all things, hopes all things, endures all things. Read that a few times. Ponder it, then live out that love each day with the people you live with, go to school with, work with, worship with. As you worship and live with others in the Church, and in life in general, love them today as you will love them after the last day because in Christ you are love. The Devil and his demons want to destroy this love. Be on guard against the devil tempting you to puff yourself up in order to treat others badly; to look down on others. Be aware of the Devil trying to make you think that you are better than the person in pew in front of you. The Devil will use this to tear apart the Body of Christ as C.S. Lewis masterfully captures in his devilish book. Be aware also of the Devil accusing you of being too great a sinner for Jesus to forgive. In Christ we are one. One body; one spirit; one baptism. We eat together of the Body of Christ and drink His Blood. We are one in Christ. Love God and love your neighbor. Love like the last day has already come. Amen. Previous Article This is not the messiah you are looking for. Next Article Jesus loves bottom feeders.